The Pacific Crest Trail is a unique educational and recreational treasure and one of the finest trails anywhere in the world. The PCT reveals the West’s unique blend of environs and beauty. Untold thousands are deeply devoted to the trail. For many the PCT has become a way of life. Their stories are compelling and little known. The trail spans 2,650 miles from Mexico to Canada through three western states: California, Oregon and Washington. It starts near Campo, California, and ends on the U.S. border at Manning Provincial Park in British Columbia. First proposed by Catherine Montgomery in 1926 and championed by Clinton C. Clarke from the 1930s to the 1950s. Designated as one of the first National Scenic Trails in 1968, along with the Appalachian Trail. Crosses 26 National Forests, 7 National Parks, 5 State Parks and 4 National Monuments. About 10 percent of the PCT is on private land. Hundreds of thousands of people use the trail each year. It takes the average thru-hiker about five months to walk the entire trail. They leave Mexico in April or May and reach Canada at the end of September. Fewer than 5% of hikers go southbound. The trail is a hiker and equestrian trail. A small number of hardy horseback riders have ridden the entire trail. Most users are out for day hikes, weekend or week-long backpacking trips. They are birders, naturalists, families, hunters, anglers and groups of friends. It’s a common mistake to call the PCT the Pacific Coast Trail. Thanks for remembering to correctly call it the Pacific Crest Trail. Pacific Crest National Scenic Trail and Pacific Crest Trail are both correct names. We encourage you to simply use Pacific Crest Trail and the PCT acronym. Formed in 1977 with the merger of the Pacific Crest Trail Conference and the Pacific Crest Club. Has a Memorandum of Understanding with public agencies to manage the trail. Major partner of the U.S. Forest Service in managing the trail. A main office in Sacramento, California, and five regional offices, harbor 27 staff. A 16-member Board of Directors provides leadership and governance. 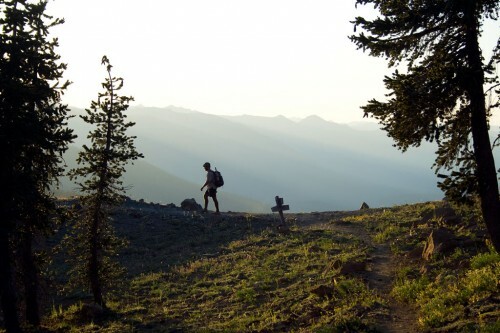 The Pacific Crest Trail Association preserves, protects and promotes the trail. Develop and maintain an optimal PCT. Engage and support volunteers to steward the trail. Train volunteers in trail maintenance. Construct and maintain PCT to standard and install signage. Advocate for the PCT on the local, state and federal levels. Work with agency and industry partners to support the trail. Respond to and manage wildfire and other closures. Respond to threats to the trail, including logging, illegal trespass and development proposals. Protect the trail through land acquisition and easements. Member benefits include: a subscription to Pacific Crest Trail Communicator magazine; discounts on all PCTA activities and store items; an invitation to trail projects and trail classes; and the knowledge that they’re helping protect and preserve the PCT for future generations. Trail work volunteer opportunities are available along the entire length of the PCT. The PCTA is a leader in providing free, high quality trail work opportunities. Experienced crew leaders train all volunteers, and provide food, water, tools, instruction and supervision. We have lots of volunteer opportunities and appreciate the media mentioning them. Please email [email protected] for a list of upcoming volunteer projects in your market area.